It's time for another episode of 205 Live on the WWE Network! Last night on Raw, Neville made the announcement that his next challenger for the Cruiserweight Championship will be determined on 205 Live. Tonight, we will see a (fatal) 5-way elimination match where the winner faces Neville for the Cruiserweight Title at No Mercy. Who will be the next challenger for the "King of the Cruiserweights" and his crown? Tune in to find out and hit F5 to refresh the live recap! 205 Live is underway with commentator Vic Joseph and his new broadcast partner NIGEL McGUINNESS joining him for the first time. TJP heads to the ring and we get clips from 205 Live last week where he helped Rich Swann win his match against Ariya Daivari, and then getting even more physically involved even after claiming he was injured for the past several weeks. As Daivari comes out to be TJP's opponent, in his pre-match comments he says he will inflict pain on TJP over and over again. Before the match gets underway, however, Rich Swann dances to the ring to watch this match at ringside with a bag of popcorn. The match starts out hot with both men going after each other until Daivari beats him down in a corner. TJP swings through the ropes, does a crossbody onto the ropes, then uses the ropes for a springboard dropkick. TJP gets a 2-count, hits a European uppercut, Irish whip across the ring, lands on his feet on the middle turnbuckles, Daivari trips him up and drops him with a reverse DDT. Daivari gets a 2-count, delivers a backbreaker then puts him in a surfboard stretch. TJP counters with a flip kick, punches him, Daivari kicks him, TJP comes back with a springboard forearm, quick strikes, delivers the 2 Amigos (suplex float over to a back suplex), goes for the Detonation Kick, Daivari escapes and hits a jumping knee for 2. Daivari stomps on him, TJP falls out to the floor, Swann continues to watch from atop the announce table eating his popcorn, Daivari puts TJP back in the ring, gets on the top rope, looks back at Swann, goes for the diving frog splash, but TJP moves out the ring and hits the Detonation Kick for the win. Swann gets in the ring to tell TJP that he faces him one-on-one next week. TJP doesn't look pleased, Swann daps in front of his "friend" and Nigel says Raw GM Kurt Angle can make that decision. We get more clips from 205 Live last week to fcous on the No-DQ match between Brian Kendrick and Jack Gallagher. Kendrick will be in action later being involved in the Fatal 5-Way match. Daivari is passing out flyers backstage before a quick commercial break. As soon as the break is over, we immediately get confirmation that TJP will face Rich Swann next week. "Hello! I believe in freedom of expression. I am here to talk about a better 205 Live. What have I gotten? 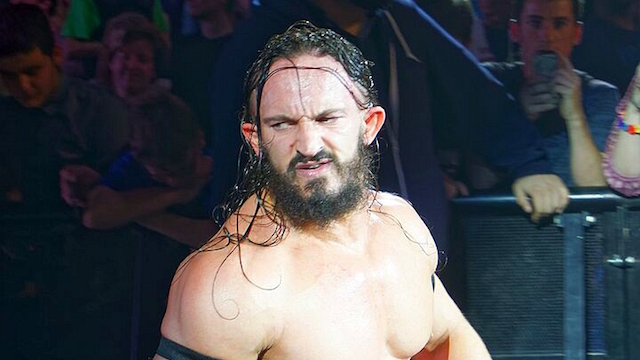 I'll tell you what I haven't gotten, a spot in tonight's 5-Way Match for a chance to face Neville at No Mercy!" Gulak says people fear what they don't understand when it comes to him being considered for a title shot. He presents a PowerPoint presentation for his campaign. "No jumping off the top rope" is the first, "no jumping off the middle rope" is the second slide, and the final slide is non-existing because TOZAWA comes out to cut him off. They lock up, Gulak with a side headlock, takeover, Tozawa gets to his feet, pushes him off, Gulak hits a shoulder block, Tozawa does an armdrag, dropkicks him, and Gulak backs away to a corner. Tozawa lands another dropkick, Gulak grabs him by the ear, Tozawa slaps him away and gives him a back body drop. He rolls through a sunset flip, kicks him in the chest, hits a basement dropkick, grabs him by the neck but gets FLUNG off the apron crashing into the barricade! Gulak beats him down, brings him back into the ring, taunts him, puts him in a rear chinlock, and Tozawa makes it to the ropes. Gulak chops him, steps on his face in a corner, stomps him down, Tozawa fights back, Gulak clubs him on the chest, uses the bottom rope for a stomp then puts him in a pretzel-like submission hold with an armbar. Tozawa starts his battle cry, the crowd responds, he starts to fight back, lands on his feet, right punch, catches Gulak with a hurricanrana, running kick to the face knocking Gulak to the floor, and he hits the suicide diving headbutt! Tozawa gets a 2-count back in the ring, back kick, crawls through his legs, delivers a side suplex, gets a near-fall, gets on the top rope, but Gulak is back up, Tozawa jumps over him, Gulak rolls him up for 2, Tozawa roundhouse kicks him in the head, goes back up top, connects with the DIVING SENTON and gets the 3-count! Backstage, Dasha Fuentes interviews Enzo Amore about his comments on Raw last night about "working smarter, not harder" and he says he is 3-and-0 while in 205 Live. He gives props to the other cruiserweights like Cedric Alexander, and runs down his opponents that they can get it done. Neville shows up, calls him ridiculous, and says 205 Live is more "real competitors" and "serious athletes." Neville tells him he has no business being in the same ring as him. Enzo says he's not playing any games and claims the title will be his at No Mercy. The main event is next! (By the way, it can't be considered a "Fatal" match if there are eliminations. Fatal 4- and 5-Way matches should imply one fall/sudden death rules. Just sayin'!) All of the superstars enter (as listed below) with Enzo being the last one out. Enzo: "My name is Enzo AMore, and I am a certified G, and a bonified stud, and you can't teach that! Bada-boom, realest guy in the room, how you doin'?! 1, 2, 3, 4 dudes, butone ONE WORD to describe, and I am gonna spell it out for you. S-A-W-F-T! (SAWFT!)" All four men focus on Enzo as the bell dings, and he ducks out the ring to avoid them. Metalik rolls up Kendrick for 2, Cedric chops Nese, Metalik whips Kendrick into Nese, then Cedric tosses Metalik into them for a double dropkick. Cedric and Metalik wrestle each other with armdrags, leapdrogs, springboards, and Metalik gives him a hurricanrana followed by a missile dropkick. Nese yanks Metalik out the ring and he lands flat on his face. Nese gets in the ring for a face-off with Cedric, Kendrick lurks on the apron, and Enzo yanks him off. Cedric hits Nese with a hard back elbow, Nese drops down, kips up, quick kicks, Cedric backflips into a hurricanrana and dropkicks him then covers for 2. Cedric chops him, Enzo claims he's smarter than the average bear, Cedric hits a European uppercut to Nese, Nese tosses him onto the apron and Cedric kicks him in the head while Neville looks on. Nese gives Cedric a gutbuster, Enzo rolls Nese up for 2, Kendrick punches Enzo then suplexes him from the ropes to the floor! Kendrick throws Enzo back into the ring, Nese covers for a 2-count, puts him in a chinlock, hits a legdrop, whips him into a corner and delivers a backbreaker for 2. Kendrick is back in, suplexes Enzo, jackknife cover for 2, Nese kicks him, knee strike, Kendrick stomps on him, Nese punches him in the gut, and both men whip him into a corner. Enzo comes back with a headscissors to Nese, punches both men, flatliner to Kendrick, and hits a fiel goal kick to Nese's gut! Kendrick goes for a full nelson, Enzo escapes, but suffers a double superkick from Kendrick and Nese then falls to the floor. Cedric and Metalik both dive onto Kendrick and Nese with diving crossbody blocks. Cedric then catches Metalik with a standing Spanish Fly and all men are down as the crowd chants "This is awesome!" Cedric gets on the top rope, Nese cuts him off, goes up to meet him, Cedric fights back, Kendrick joins them, then Metalik does a SUNSET FLIP POWERBOMB TAKING OUT EVERYBODY with the tower of doom spot! ENZO ROLLS UP CEDRIC ALEXANDER AND GRABS THE TIGHTS FOR THE 1-2-3!! WINNER and #1 Contender for the Cruiserweight Title: ENZO AMORE. Cedric Alexander is shocked! He can't believe it after all the hard work he just put in that match getting the first three eliminations, only for Enzo to just sneak in and cheat his way to another victory. Enzo Amore now gets the opportunity to face Neville at No Mercy for the Cruiserweight Championship. That's all for 205 Live!